Fresh flowers supplied by our local growers helps bring that garden feeling into any home. This charming posy gives the impression of being `freshly picked` straight from the garden, and includes a pleasant mix of deep purples and pastel pinks. 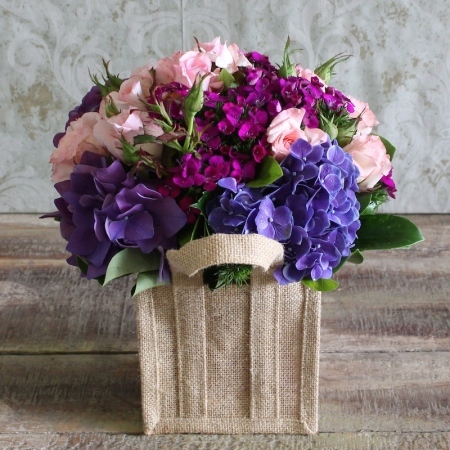 We present our `Garden Fresh` posy in a reusable hessian bag which creates that rustic feel. The hessian bag is a unique gift idea and is perfect for any occasion and of course it can be reused or recycled, a great way to help the environment. Order online by 2:00pm and receive same day delivery.